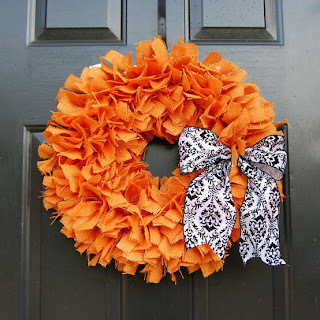 So, today is day 4 of the Fabulous Fall Blog Challenge. Today's topic: Fall decorating. Um, hello, Gorgeous!! I heart this SO much! I will have to track down the source of this pretty little thing and see how to purchase or make it. 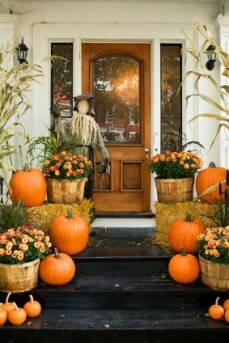 I usually do some sort of pumpkin, bale of hay and mums combo with my front door. Sometimes throw in some cornstalks. My front door has never looked this good! Wouldn't these make my mantle pretty. One problem, I love candy. 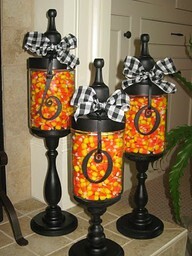 Having 3 big candy dishes so easily accessible would be really bad for my post-baby weight loss efforts. I would love to sit here a little longer, but I have a toddler who needs to be in bed.